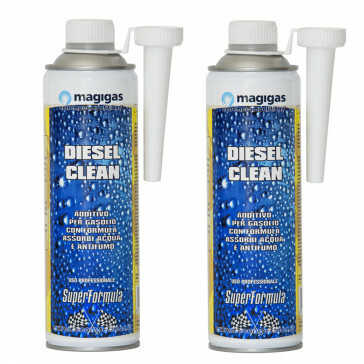 Diesel Clean is a special fuel treatment for diesel engines. Today Diesel engines are far more widespread than in the past but, as in the past, they are dealing with the same problems: smoke, particulate matter and water residual in the fuel. 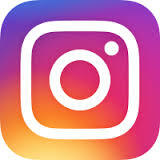 Anti-smoke and water adsorbing fuel treatment Diesel Clean is a special fuel treatment for diesel engines. Today Diesel engines are far more widespread than in the past but, as in the past, they are dealing with the same problems: smoke, particulate matter and water residual in the fuel. 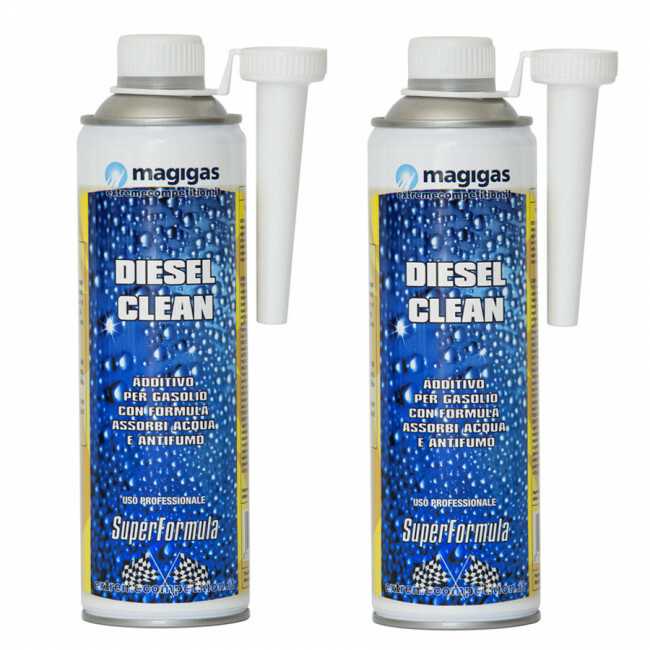 Diesel Clean is a very performing product and the content of one bottle/can (1/2 litre) exceeds the amount required for a full tank of fuel. Actually, it’s enough for more than 50 litres (12 Gallons) of diesel. Pour Clean Diesel into the tank of your vehicle before refuelling and do not use it at every refuelling but alternately with the pump product. Clean diesel minimises those fumes, smells that sometimes diesel engines emit, and dramatically cuts particulate emissions. Particulate matter is one of the fiercest enemies of our cities and of our lungs (is one of the source for famous suspended "fine dust") and the challenge for removing such pollutants begins from a perfect maintenance and combustion. Clean diesel is the Magigas Extreme Competition team's response to people having this kind of problems and wanting to address them in the best way out of necessity or simple ecological awareness Furthermore, Clean Diesel performs another important function by solving a problem so critical for diesel engines’ owners. As a matter of fact its molecules "capture", literally, the possible water droplets, by dissolving them and thus making re-combustion process possible. Therefore Diesel Clean prevents also the clogging of the filters, and not only; cold starts especially in the harshest climate, will be facilitated by its regular use, thus avoiding rust and corrosion of components. Its combined action prevents injectors seizing, without side effects on catalytic converter. Clean diesel, can be used in cold climates because it solves the problems about fuel freezing and about paraffin depletion. Clean Diesel is suitable for use in all diesel engines, including Multijet, DI, IDI, common rail systems and the JTD. It helps in the prevention of big and small problems so it can become a valuable ally for driver who travels lots of kilometres. Based on this it is strongly recommended for heavy-duty vehicles of any kinds. How to use it: One bottle in one full tank of fuel. Use every 2/3.000 Km is recommended. Pour Clean Diesel into the tank of your vehicle before refuelling.